The Download Video command will download a video from a website and save it to your local disk or a database. The most common video formats are mp4, ogg and Flash. 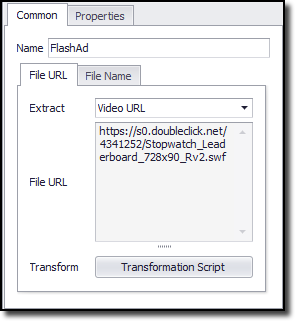 Content Grabber cannot extract content from within a video (such as Flash objects), but can only extract the video file as a whole. The command has a corresponding web selection that will normally select the link to the video. Optionally, the command can extract data from a web element and then calculate the direct video URL. If the agent is saving the video to a database, then by default this command will generate two data fields: one data field will contain the video binary data and another will contain the name of the video. If you're saving the video to the file system, the command will generate only one data field containing the full file path to the video file. You can also use the property Export URL to generate a data field that contains the video URL. •File URL - contains the URL for the video. •File Name - contains the name of the downloaded video. We explain the details of each below. The entry in this tab determines the specific URL for the video, and the agent uses this URL to download the video at run time. You can choose the HTML attribute that the command should extract to get the video URL. The default value is Video URL, which will cause the command to look at the entire tag HTML and extract the first appropriate video URL. Click the Transformation Script button to enter regular .NET expressions or write a .NET script that will transform the document URL to meet your requirements. See the Content Transformation Script topic for more information about content transformation scripts. The entry in this tab contains the file name. From the drop-down menu, you can choose the HTML attribute that you want to use as the name. Click the Transformation Script button to enter regular .NET expressions or write a .NET script that will transform the document name to meet your requirements. See the Content Transformation Script topic for more information about content transformation scripts. Use the Data Value option to specify that an agent data value will be used as file name. The agent data can come from a data provider, an input parameter or captured data. Use the Detect File Extension option to specify if agent should try and detect the file type of the downloaded document, or if a transformation script or a data value will provide a file name that includes a file extension.